For booking, info, lessons, or anything else at all, please feel free to shoot me an email at mfibish@gmail.com . If you'd like to receive announcements about upcoming events, please email me to be added to my mailing list. If you are interested in my quilts and quilt prints click here. 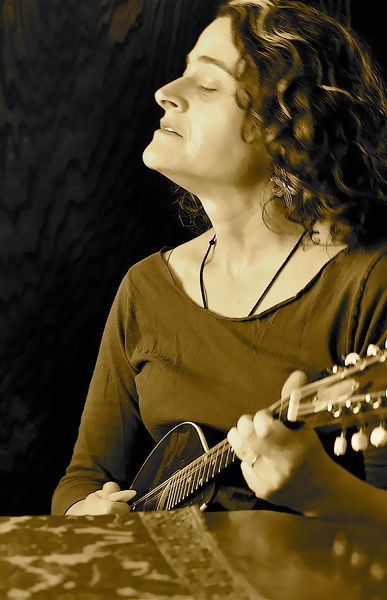 I teach private lessons on mandolin and mandola, in person (in Marin County, CA) and over Skype, a well as group classes and workshops, online at Peghead Nation, and at many music camps. Details on current class offerings are below, or drop me a line for more info at mfibish@gmail.com. Group classes are a fantastic way to learn more tunes and grow confidence, while developing a group of compatriots who know the same tunes you do! We cluster tunes into sets so that you'll have some ready to go when someone invites you to start a tune at a session. We work on developing skills as well as learning tunes - we do exercises together to develop a strong rhythmic right hand, as well as to develop left hand patternings and fretboard knowledge. I will be starting classes at three levels, described below. If you are interested in joining a class, shoot me an email at mfibish @ gmail dot com. If you don't see a class below that addresses your skill level or interests, or want to talk about which environment might be best for you, let me know, and we'll figure out a path for you. 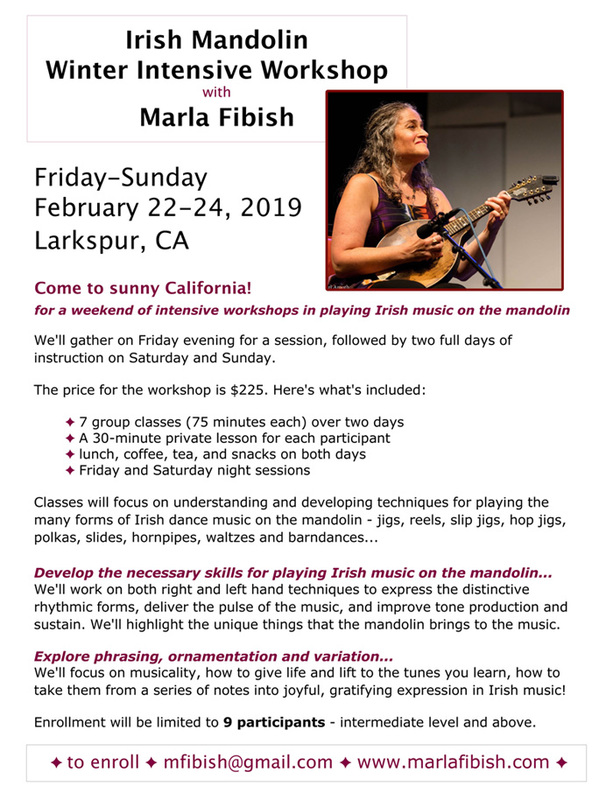 This class focuses on the basics of getting started on the mandolin, laying the foundation for learning to play Irish music on the instrument (techniques learned would also apply to interest in other trad forms -- Old Time, European, etc., but not bluegrass or classical music). Emphasis is placed on exercises that develop left hand placement and dexterity, while building on a solid rhythmic right hand technique, and (of course!) learning a few tunes. Classes meet bi-weekly on alternate Thursday nights for six 90-minute sessions - 7:15-8:45. Price for the series: $180. Class meets in Larkspur. Address provided with enrollment. This class focuses on basic technique for playing Irish music on the mandolin. In the class we work with exercises to get both right and left hand working for playing tunes. Participants will learn 8-12 tunes in the course of the series. Recordings of the tunes are made available ahead of the class meetings. Classes meet bi-weekly on alternate Monday nights for six 90-minute sessions -- 7:00 - 8:30. Price for the series: $180. Class meets in Larkspur. Address provided with enrollment. This class focuses on Irish tune acquisition and mandolin technique and ornamentation - both general and tune-specific. The group learns two, often three, tunes per class session. Tunes are learned in sets, to facilitate session playing. Recordings of the tunes are made available ahead of the class meetings. Classes meet bi-weekly on Thursdays for six 90-minute sessions -- 7:30 - 9:00. Price for the series: $180. Class meets in Albany. Address provided with enrollment. Each camp is always a completely different musical experience - each wonderful in a different way. There is nothing like immersion in a music camp environment to really get you fired up about your music! Please check out my events page for more info about each music camp...and sign up early! The fantastic photo of my mandolin on the home page was taken by Fionn O Lochlainn. The photos of me playing on the About page and on this page were taken by the lovely and talented Dana Dubinsky. Thank you both for your beautiful work! Thank you Mike Considine for your guidance and fabulous work in putting together this site. You're the best!